This article is about the capital of Bolivia, coterminous with the Capital Section. For other uses, see Sucre (disambiguation). Location of Sucre within Bolivia. 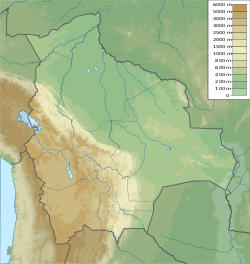 Sucre (Spanish: [ˈsukɾe]) is the constitutional capital of Bolivia, the capital of the Chuquisaca Department and the 6th most populated city in Bolivia. Located in the south-central part of the country, Sucre lies at an elevation of 2,810 meters (9,214 feet). This relatively high altitude gives the city a cool temperate climate year-round. Very much a Spanish city during the colonial era, the narrow streets of the city centre are organised in a grid, reflecting the Andalusian culture that is embodied in the architecture of the city's great houses and numerous convents and churches. Sucre remains the seat of the Roman Catholic Church in Bolivia, and a common sight is members of religious orders dressed in traditional costume. For much of its colonial history, Sucre's temperate climate was preferred by the Spanish royalty and wealthy families involved in silver trade coming from Potosí. Testament to this is the Glorieta Castle. Sucre's University (Universidad Mayor Real y Pontificia de San Francisco Xavier de Chuquisaca) is one of the oldest universities in the new world. 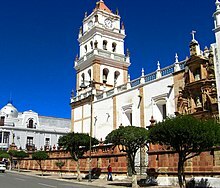 On May 25, 1809 the Bolivian independence movement was started with the ringing of the bell of the Basilica of Saint Francisco. This bell was rung to the point of breakage, but it can still be found in the Basilica today: it is one of the most precious relics of the city. Until the 19th century, La Plata was the judicial, religious and cultural centre of the region. 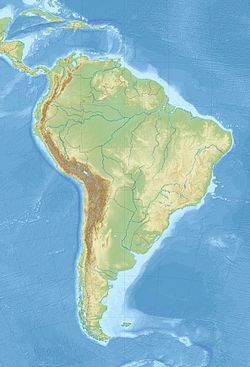 It was proclaimed provisional capital of the newly independent Alto Peru (later, Bolivia) in July 1826. On July 12, 1839, President José Miguel de Velasco proclaimed a law naming the city as the capital of Bolivia, and renaming it in honor of the revolutionary leader Antonio José de Sucre. After the economic decline of Potosí and its silver industry, Sucre lost the Bolivian seat of government when it was moved to La Paz in 1898. Many[who?] argue Sucre was the location of the beginning of the Latin American independence movement against Spain. The first "Grito Libertario" (Shout for Freedom) in any Western Hemisphere Spanish colony is said to have taken place in Sucre in 1809. From that point of view, Bolivia was the last Spanish imperial territory in South America to gain its independence, in 1825. In 1991 Sucre became a UNESCO World Heritage Site. The city attracts thousands of tourists every year due to its well-preserved downtown with buildings from the 18th and 19th centuries. Nestled at the foot of the twin hills of Churuquella and Sika Sika, Sucre is the gateway to numerous small villages that date from the colonial era, the most well-known of which is Tarabuco, home of the colorful "Pujllay" festival held each March. Most of these villagers are members of one of the indigenous ethnicities. 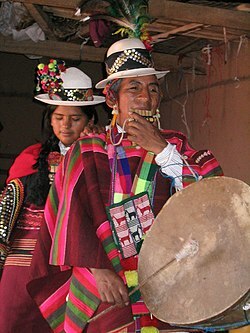 Many dress in clothing distinctive to their respective villages. Sucre is the capital of Chuquisaca department and one of the capitals of Bolivia, where the Supreme Court is located. 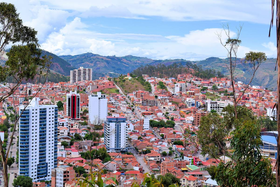 The government of the City of Sucre is divided into the executive and legislative branches. The Mayor of Sucre is the head of the city government, elected for a term of five years by general election. The legislative branch consists of the Municipal Council, which elects a President, Vice President and Secretary from a group of eleven members. The current mayor of Sucre is Iván Arciénega, who defeated former mayor Jaime Barrón in elections held on March 30, 2015; he took office on May 25. June 22, 2010 January 10, 2011 Verónica Berríos MAS Designated as interim Mayor by Sucre's Council in Resolution 335/10 after Barrón was indicted on charges of organizing the violence of 24 May 2008, with the support of MAS, New Citizen Alternative, and Domingo Martínez. January 10, 2011 January 27, 2011 José Santos Romero MAS Designated as interim Mayor by Sucre's Council in Resolution 03/11, with three MAS votes (but not Berríos' alternate), four PAÍS votes, and that of Lourdes Millares. The current Municipal Council was elected in the regional election of April 4, 2010. The election was by proportional representation with the Pact of Social Integration and the Movement Towards Socialism gaining the largest and second largest shares of the vote. Sources: "Alcalde electo en Sucre sólo tendrá cuatro concejales". Correo del Sur. April 6, 2010. Retrieved February 3, 2011. "Crisis institucional se apodera del flamante gobierno municipal de Sucre". Los Tiempos. June 2, 2010. Archived from the original on June 4, 2010. Retrieved February 3, 2011. Sucre is divided into eight numbered districts: the first five of these are urban districts, while Districts 6, 7, and 8 are rural districts. Each is administered by a Sub-Mayor (Spanish: Subalcalde), appointed by the Mayor of Sucre. The rural districts include numerous rural communities outside the urban area. Sucre is served by Alcantari Airport, situated 30 km (19 mi) to the South. Sucre has a subtropical highland climate (Köppen: Cwb), with mild temperatures year round. Each of the well known names represent a specific era of the city's history. Charcas was the indigenous name for the place upon which the Spaniards built the colonial city. La Plata was the name given to the emerging Hispanic city of privilege and honor. The name Chuquisaca was bestowed upon the city during the independence era. Sucre honors the great marshal of the Battle of Ayacucho (December 9, 1824), Antonio José de Sucre. "La Ciudad Blanca" is a nickname that was bestowed upon the city because many of the colonial style houses and structures are painted white. Sucre has the most important sport facilities in Bolivia, and the most practiced sport in the city is football. Sucre has the second-biggest football and Olympic stadium in the country, the Estadio Patria. It is the home ground of Sucre's first-division team in the Bolivian professional league, Universitario de Sucre, the 2008 champions. Other sports are also practiced, such as swimming at la Piscina Bolivariana, basketball at numerous courts around the city, as well as taekwondo, kung fu, volleyball, tennis and racquetball. The area once had a German school, Deutsche Schule Sucre. Built in 1621, it is perhaps the most important building of the nation. The republic was founded in this building by Simón Bolívar who wrote the Bolivian Constitution. The "Salón de la Independencia" houses the Bolivian Declaration of Independence. Built on the same year of the foundation of the Republic, it is the first and the most important historical, bibliographical and documentation center of the country. The National Library has documents that date from 16th century. Built between 1559 and 1712, the cathedral has the "Museo Catedraliceo" which is the first and most important religious museum of the country. The "Pinacoteca" has a vast collection of paintings by Colonial and Republican masters and also by Europeans such as Bitti, Fourchaudt and Van Dyck. The Cathedral contains a vast amount of jewelry made of gold, silver and gemstones. Built in 1609, was an important religious and historic institution during colonial times. One of the best buildings of republican architecture, this was completed in 1896. 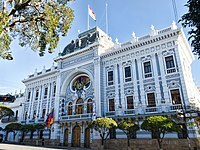 It was the first Palace of Government of Bolivia but when the government was moved to La Paz it became the Chuquisaca Governorship Palace. On July 16, 1827 the Supreme Court of the Nation was established. Its first president was Dr. Manuel Maria Urcullo. Others prominent in its history include Dr. Pantaleon Dalence, who was twice president of the Supreme Court and through his qualities became known as the 'Father of Bolivian Justice'. This institution was installed in several places before moving to its current building. It was designed in the neoclassical style under the canons of French academicism and was inaugurated on May 25, 1945. Constructive order and harmony predominates in the different areas, some of which date from the late nineteenth century. Ornate mausoleums, tombs and gardens with magnificent old trees populate the space that is home to the graves of important people in the arts, sciences and the history both of Bolivia and of Latin America. Because of the tranquility offered by the site, many students choose to study here. ^ a b Donoso, Yuvert. "Arciénega triunfa; le falta mayoría - La Razón". La Razón (1 April 2015 ed.). Retrieved May 8, 2015. ^ a b c "Fallo judicial restituye a Alcaldesa de Sucre". Los Tiempos [byline: Correo del Sur]. January 28, 2011. Archived from the original on January 30, 2011. Retrieved January 30, 2011. ^ a b "Escándalo frena elección edil y abre paso a negociaciones". Correo del Sur. June 2, 2011. Retrieved December 13, 2011. ^ "Torres ya es Alcalde de Sucre". Correo del Sur. January 31, 2012. Archived from the original on February 4, 2012. Retrieved February 6, 2012. ^ "Climate: Sucre - Climate graph, Temperature graph, Climate table". Climate-Data.org. Retrieved January 5, 2014. ^ "Klimatafel von Sucre, Prov. Chiquisaca / Bolivien" (PDF). Baseline climate means (1961-1990) from stations all over the world (in German). Deutscher Wetterdienst. Retrieved January 27, 2016. ^ "Deutscher Bundestag 4. Wahlperiode Drucksache IV/3672" (Archive). Bundestag (West Germany). 23 June 1965. Retrieved on 12 March 2016. p. 19/51. ^ "Home page of Cardiff Council – Cardiff's twin cities". Cardiff Council. June 15, 2010. Retrieved August 10, 2010. Wikimedia Commons has media related to Sucre.